I'm not traditionally a fan of mornings, so I wasn't too happy to meet up with Matt and Zack. It was well before sunrise, long before any sane person should be awake on a weekend. 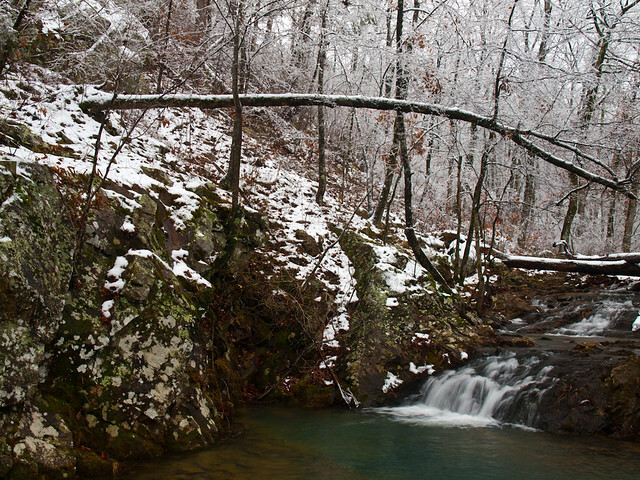 But we were heading out into the Ouachita Mountains, which still had a few inches of snow from the recent storm. 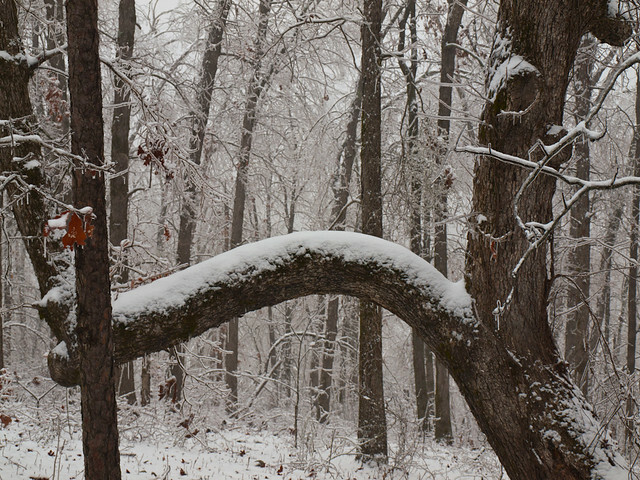 It was painfully early, but I was happy to get a few pictures of the snow before it melted. Especially since this will probably be our last bout of winter weather for awhile. So we drove west from Little Rock, and eventually hit the Ouachita National Forest. 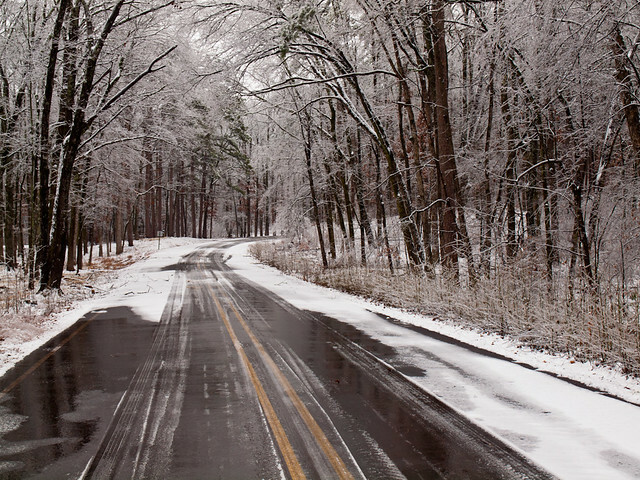 The roads were mostly clear of ice and snow in the city, but here there were still a few slick patches. 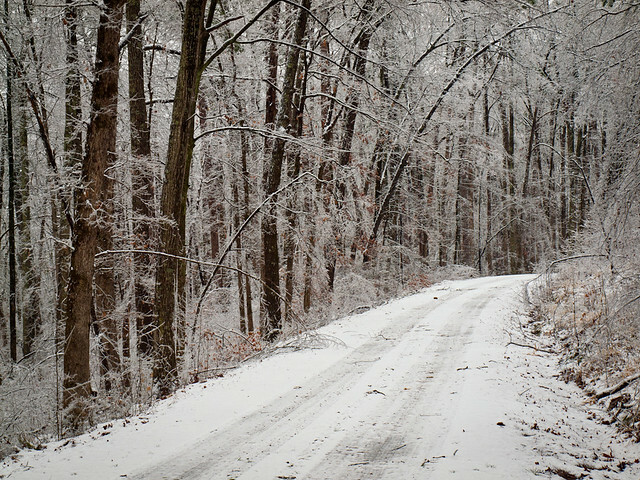 When we turned onto the Winona Scenic Drive, the road was a solid sheet of ice. I was glad I wasn't driving, since my car struggled to get up a small incline in the snow a few days before. 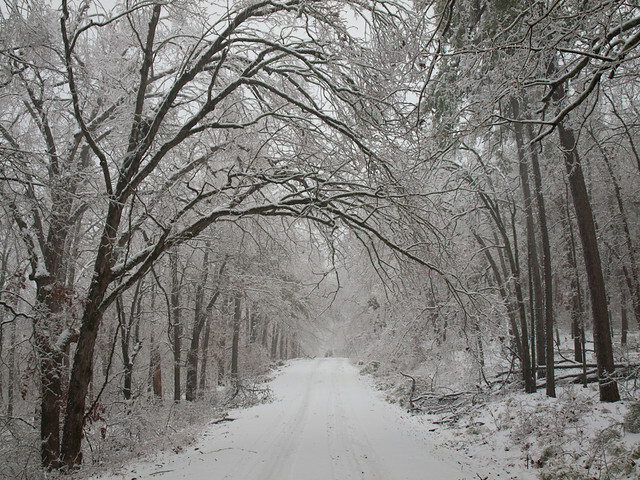 There were several downed trees along the road that we had to drive around, the pines and oaks bent under the weight of the ice and snow. There were a few tire tracks on the road, so someone else was crazy enough to drive out there. After a few miles, we were blocked by a large tree that had toppled across the road. It was too big to move, so we had to turn back. The other tire tracks, we noticed, reached this same point and also turned around. 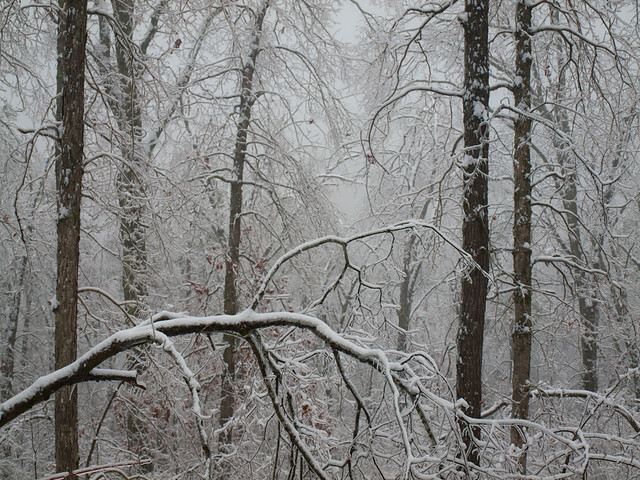 It was still amazingly beautiful out there, the woods were coated with snow and shrouded by a thick fog. We got back onto paved roads and went to visit a nearby lake. It had gotten above freezing, and the snow was melting. 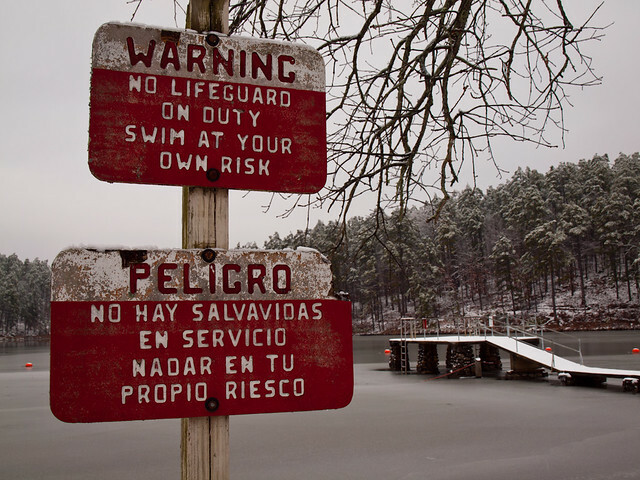 Huge chunks were sliding off the trees and crashing onto the frozen lake. We drove further on, and I was surprised to see a few other people out driving around too. After we headed back to Little Rock. I wanted to stop along the way to get a shot of a small covered bridge that I found while looking around on Google Maps. It's right outside of the city, actually only about ten minutes from where I work. And one more waterfall shot. 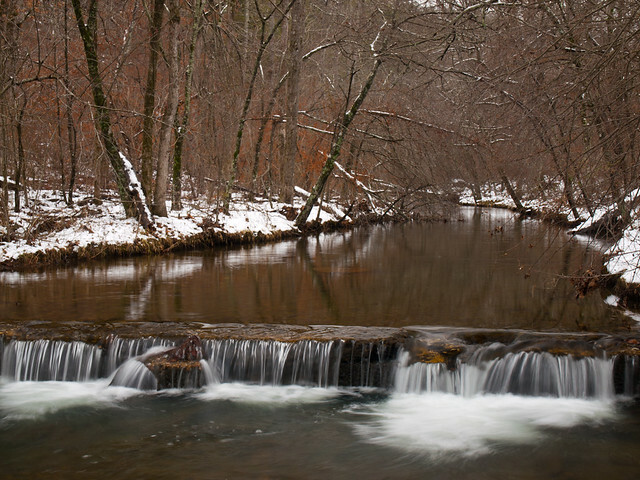 This was taken near the covered bridge, and we couldn't resist stopping for a few more shots. After that it was time to head home. I was looking forward to taking a nice nap after dragging myself out of bed so early. 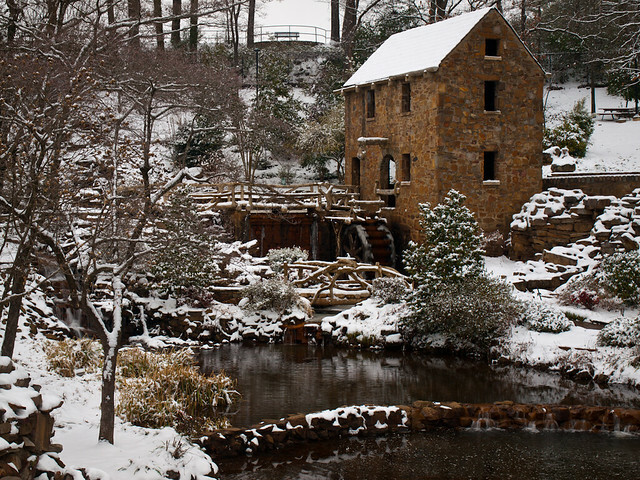 After taking pictures at The Old Mill, I drove back towards Little Rock. 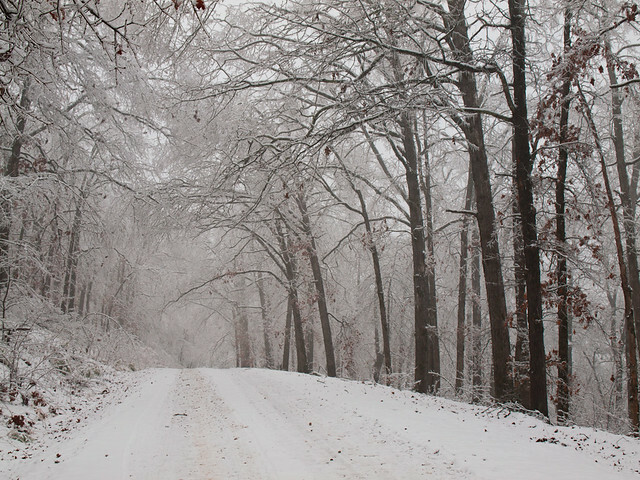 The snow from the night before had melted off the roads, but there was still a few inches on the ground. I tried to think of a few places in town that would be good places for pictures of the city in the snow. 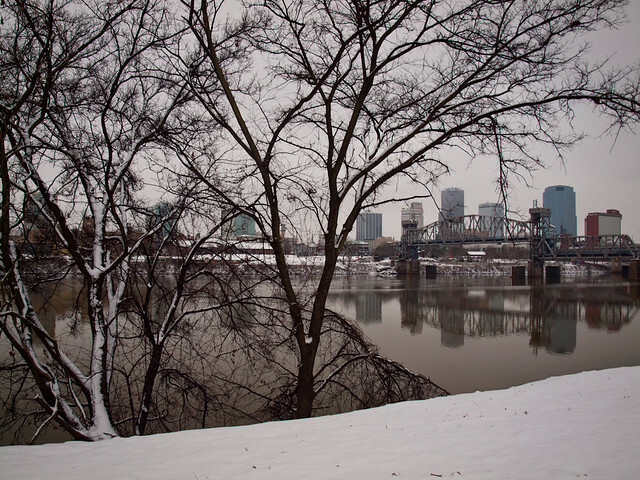 I ended up driving through Riverfront Park in North Little Rock, to get a shot of the snow and the downtown skyline. I drove over the river into Little Rock and ended up at the Old State House. 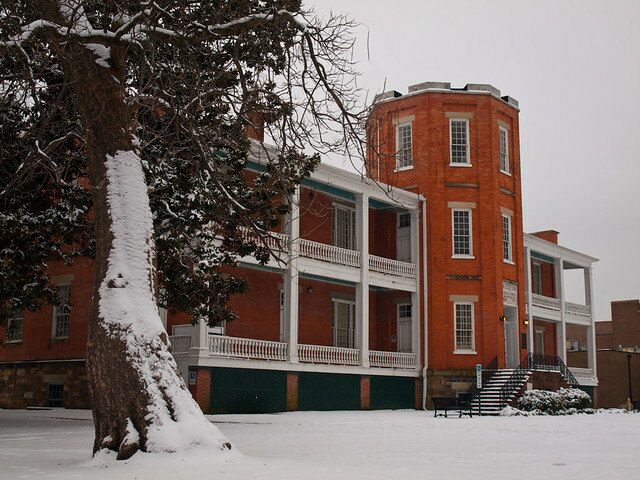 This is the first state capitol for Arkansas, built in the 1830s and 40s. The gate here was closed and the snow on the lawn wasn't trampled, except for some prints from squirrels. The next stop was MacArthur Park, and the old Little Rock Arsenal Building. 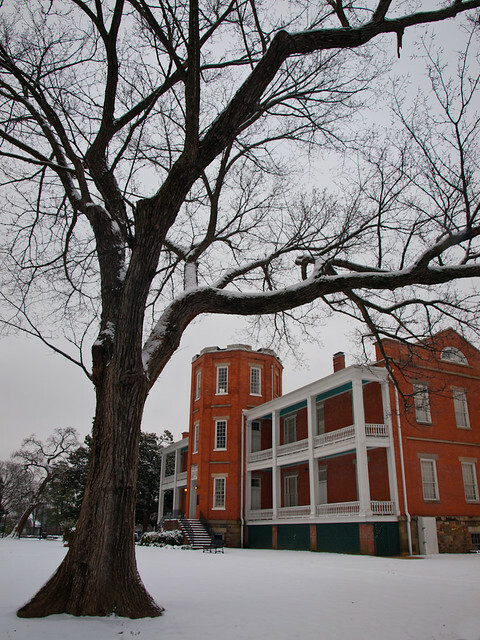 This is one of the oldest buildings in the city, and the snow around it was untouched except for a few prints around the trees from birds. 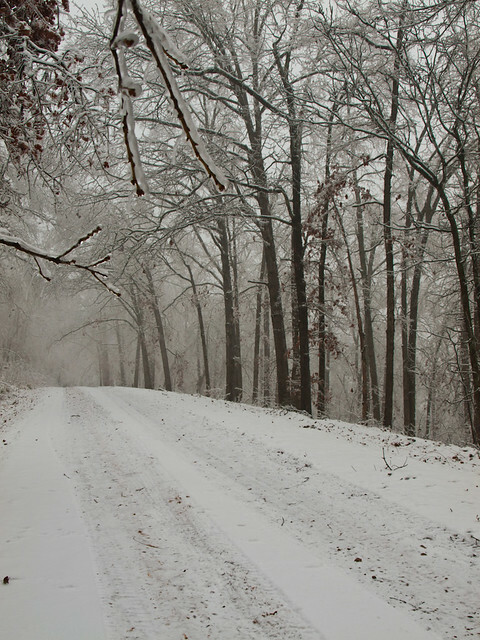 We had a little bit of a snow storm pass through Little Rock on Friday night. 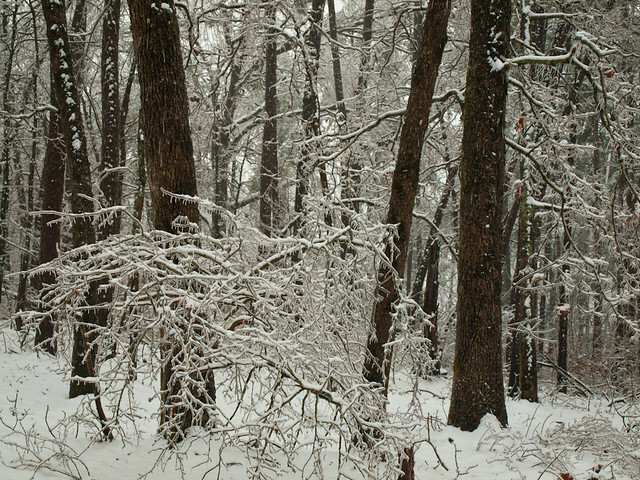 It wasn't much, only 2 or 3 inches or so, but it was enough to effectively shut down the entire city of Little Rock. 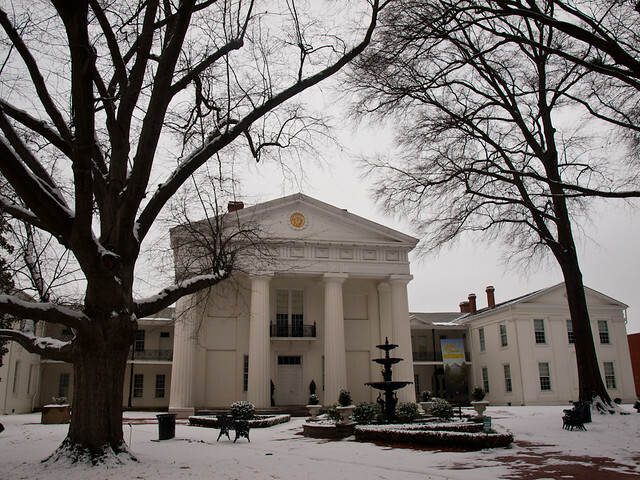 I would stand back and laugh at the silly southerners who can't handle a bit of snow on the ground. But then I was stuck in the middle of it, unable to drive my car up any hills. We went out to eat Friday night, and walked out of the restaurant to find that the streets were already beginning to get clogged with abandoned cars. Fortunately we weren't too far from home, but the neighborhood has a lot of hills and I couldn't get the car to go up any sort of incline. We ended up parking the car in a church parking lot and walking home in the snow. 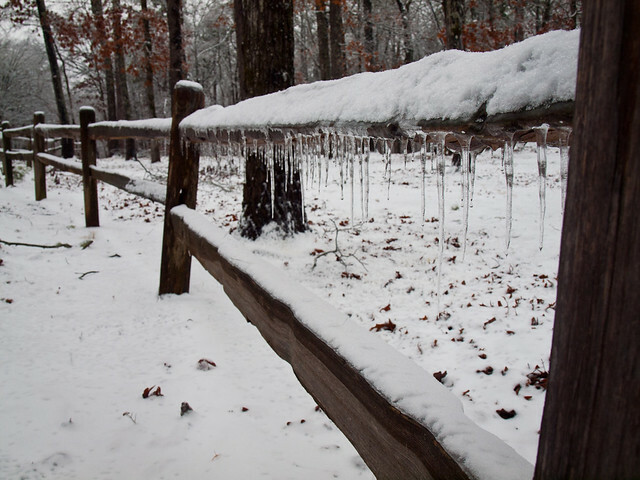 But the next day it warmed up again and the snow, which so menaced Little Rock the night before, had started melting. The roads cleared enough so I could rescue my poor car, and then head out to take some pictures. 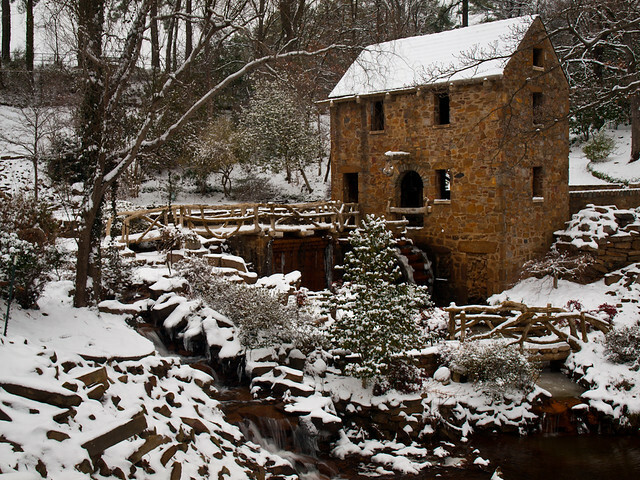 I drove to the Old Mill in North Little Rock, and hoped that it would be open. I've taken probably thousands of pictures here, but never in the snow. Every time I drove there after a snow, the gates would be locked. But luckily, some kind city worker opened up the gates of the park that day. I was amazed at how empty the park was. Usually there are throngs of people at the Mill. But for most of the time I was there, I had the place to myself.